In English there are many words which have the same or very similar meaning. Words that have the similar meaning are called synonyms. In this post, I am going to present synonyms for the words DIFFICULT and HARD. In this post, there are two quizzes to practise the new vocabulary and an infographic explaining the meaning of the words. 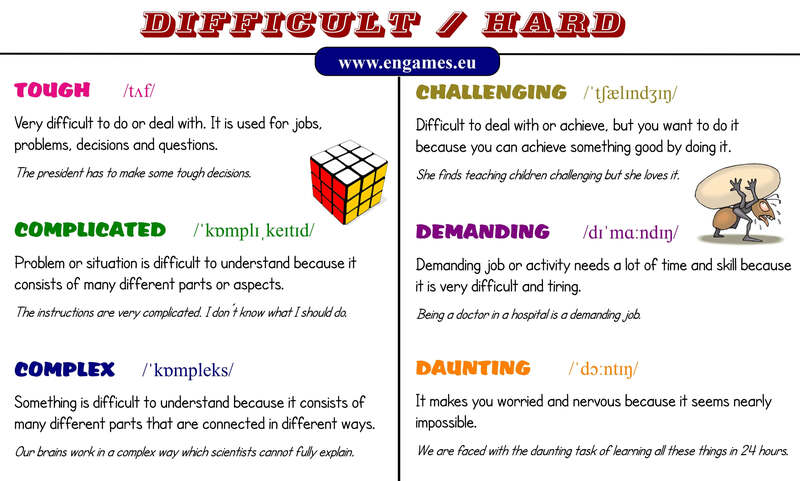 The words DIFFICULT and HARD have a similar meaning and you can use the word HARD instead of DIFFICULT nearly all the time (BUT you cannot use DIFFICULT instead of HARD!!!) However, in English there are many other words which are used instead of the word DIFFICULT. You can see them in the infographic below. The meaning of each word is explained and the usage is demonstrated in a sentence. To display the image on the full screen, right-click the picture and open it in a new window. You can print the image then, too. You can test your knowledge of the vocabulary in the following two quizzes. The first quiz consists of three parts. In the first part, you should unjumble the words and type them. In the second part, you have to choose the correct definition for each word. In the third part, you have to complete the sentences with the right words. The quiz is in HTML5, so it will play on all desktops and mobile devices. The first quiz serves as a way to practise the vocabulary. The second quiz is different. At the end, you will be asked to supply your name and your result will be displayed in a leaderboard. The quiz consists of two parts. In the first part, you see a definition and you have to type the correct word. In the second part, you see a sentence and you have to type the missing word. Good luck and share your results please. Test your knowledge of synonyms for the words DIFFICULT and HARD. He has got some (tough) questions to answer. We are faced with the (daunting) task of learning all these lines in three hours. His explanation was very (complicated). I couldn't understand anything. Her job is very (challenging) but she doesn't want to do anything else. Being a doctor in a hospital is a (demanding) job. Making a decision is a (complex, complicated) process. You have to consider a lot of aspects.